FRANKFURT (AFP) - She's a literary sensation whose debut novel has sold over 100,000 copies, yet unless you speak Dutch you’ve probably never heard of writer Lize Spit. But all that's about to change as publishers line up to translate her dark tale of friendship and betrayal. Why would a traumatized young woman return to her hometown with a block of ice in her car? It is this question at the heart of “The Melting” that has gripped readers and caused a stir unlike any other Dutch-language debut in recent years. Reviewers in Belgium and the Netherlands have hailed Spit as the voice of her generation, while international publishers have jostled to snap up the translation rights to the haunting coming-of-age story. The 27-year-old author attributes her success partly to the book’s universal themes of small-town life and growing up in a dysfunctional family, but says the Flemish literary world “was also waiting for someone new, a young new voice”. “I'm a bit stunned by it all,” she told AFP in a phone interview ahead of this week’s Frankfurt Book Fair, where Flanders and the Netherlands are the guests of honor and where “The Melting” will get its first big outing on the international stage. The story opens with the main character, 20-something Eva, driving back to her home village, determined to settle the score over childhood wrongs. Weaving between the past and the present, Spit takes the reader back to the sweltering summer of 2002, when Eva's only two friends -- both teenage boys -- embark on a chilling game of sexual exploration. A sense of creeping dread fills the pages until the shocking climax. Since it was first published in January, the book has sold over 100,000 copies -- a remarkable achievement for any debut author. But it’s an astronomical figure in a country where most novels have a print run of 2,000 and any book that sells over 10,000 copies is considered a hit. “After more than nine months it‘s still the best-selling novel in Flanders,” said Spit’s publisher Daniel van der Meer of the Dutch publishing house Das Mag. The film rights were sold three days after “The Melting” appeared in stores, and nine countries have since bought the translation rights -- including France, Spain and England. In Germany, interest was so strong that the book went to auction. 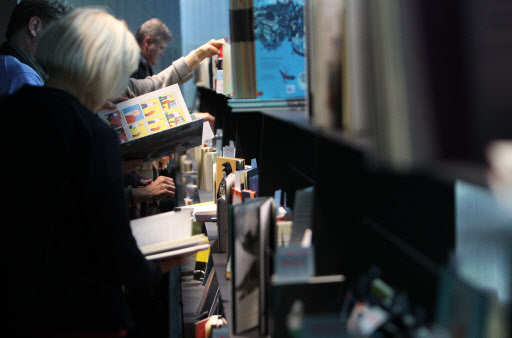 “The extremely fast foreign sales, including to the very difficult English-language market, are unprecedented for a Flemish debut,” said Michiel Scharpe of the Flemish Literature Fund, which will be showcasing Dutch-language works in Frankfurt. Van der Meer expects to add more countries to the list at the fair, where Spit will appear in a documentary that takes her back to her hometown to visit some of the locations that inspired the book. Wary of being written off as hype, Spit stresses the hard work that went into “The Melting,” noting that she read the entire book out loud three times before settling on a final version. Questions have inevitably been raised about how much of the story is based on true events, but Spit has resisted talking about her own past. “I think it’s very important to keep that distance,” she said, expressing disbelief at fans of the book who tour her childhood village of Viersel in northern Belgium expecting to see all the same places as on the page. With her frequent media appearances and a weekly newspaper column, Spit -- who is invariably pictured wearing her hair in a messy bun -- has become a celebrity at home, but says she tries to keep “a cool head” about fame. She is already planning her second novel.